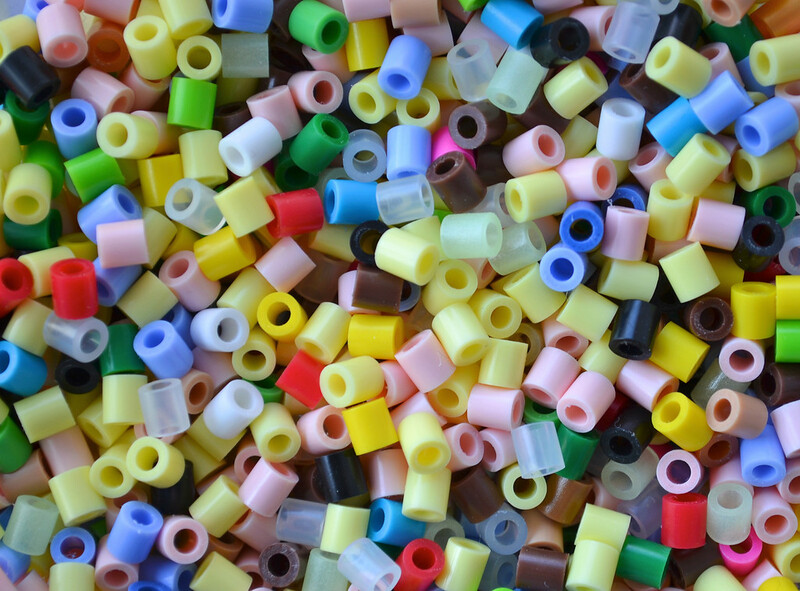 One of my favorite kid crafts is fusible beads (Perler beads/Hama beads). When I am sewing, the girls often want to be in the same room, doing something crafty. Often it is coloring. Recently, it's also been Perler beads. They've actually been making Perler bead art for a long time, but not as (suddenly) enthusiastically as now. Jenna, for instance, keeps asking to go to Michaels to spend her allowance on more beads and kits. I think the turning point was when we went out to buy bead organizers to sort the beads. Suddenly everyone wanted to 'do Perler beads'. Not just making pictures on little poky plates - sorting. Yes, sorting the beads into the little compartments is infinitely more therapeutic than even using them. Everyone wanted to sort! It must be something to do with all those happy colors, and being able to chat while our fingers were busy. Everyone had an opinion on color names ("That's salmon!" "No, that's peach!") and I was very moved when Emily said, "Why do you call that "skin color"? This (she held up a handful of coffee-brown beads) is also a skin color!" Brava, Emily. Kate made this (pre-fused) portrait of Mum. Not bad at all, for a three-year-old going freestyle. If we were living in Singapore, she might have picked the cafe-au-lait beads, rather than this Santa's Flesh (I learnt this name from a bottle of acrylic paint in this shade) for my face! These are some of the pieces the girls have made. 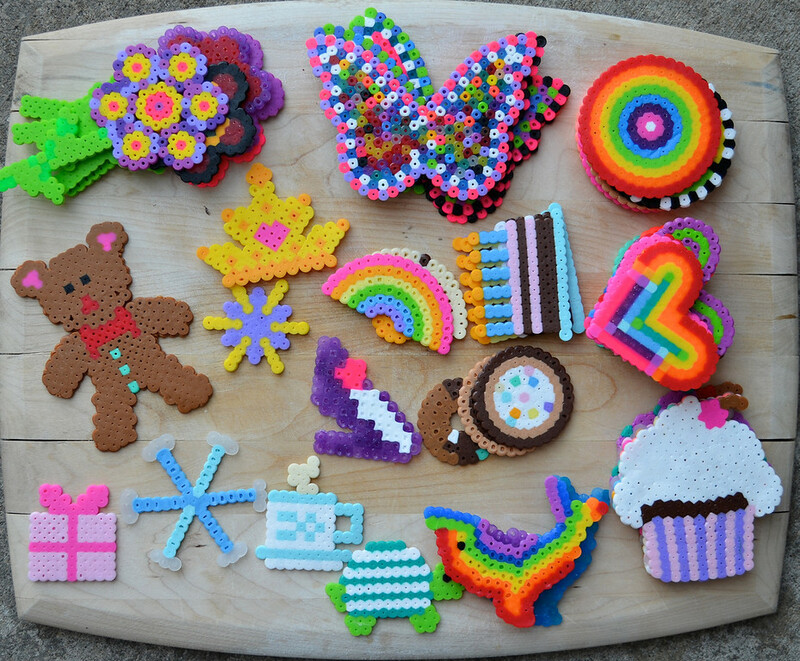 Lots of possibilities, Perler beads. 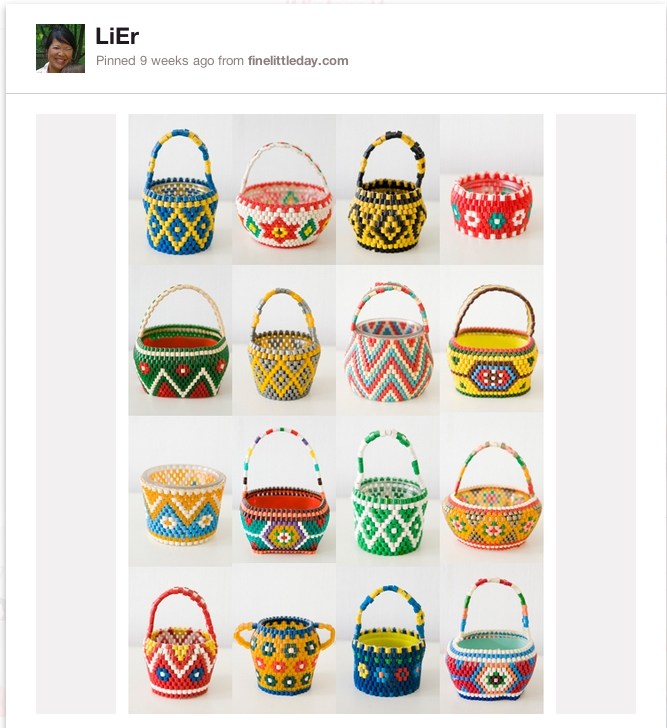 And if we should ever tire of flat art, we're going to try Perler bead basket weaving (click on image to take you to www.finelittleday.com). and bracelets (click on the image to take you to www.minieco.co.uk)! You know, one thing that's fun is that you have the iron set up and available (I'm assuming). 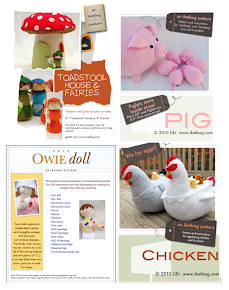 I hardly ever have the iron out, so those projects just never get finished! Your kids, and mine too! 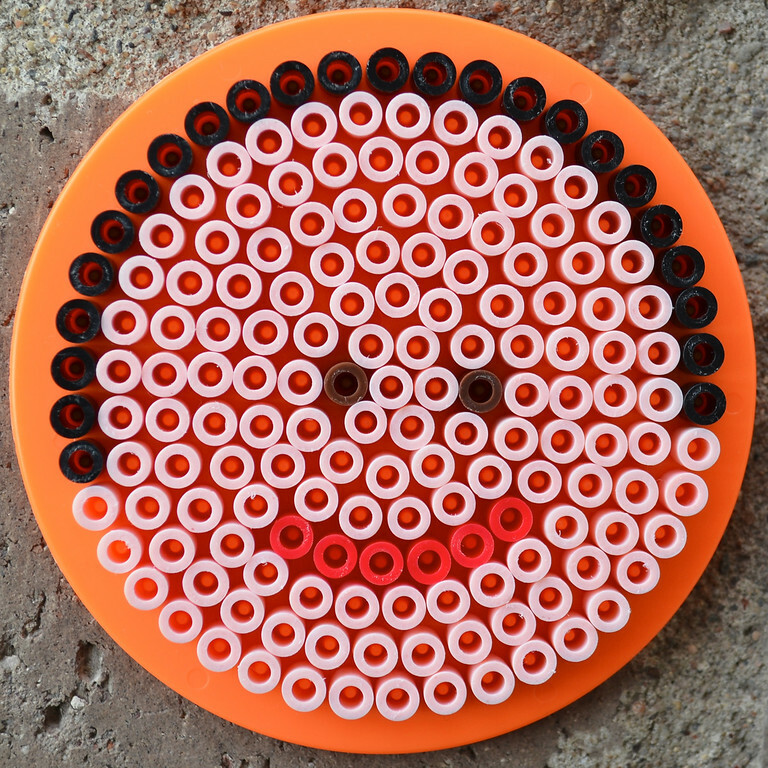 If you look on the Perler website they have all kinds of 3-D things to make. So much fun!! My kids so love those beads. I just wish their was a way to keep them from being broken. Its so sad to see the puppy dog look from my youngest Jared when he breaks his and brings it too me in little pieces. Such pretty creations! Courtney has a ton of those, too. But so far she's only brought them for me to play with once. I never thought to use them in the oven - too cool. Love your sorting trays, where did you get them and could you show a better picture of them as I would love to to do this with my collection of beads. Ah, Perler! My kids love 'em. I never saw them when I was little, and first met them as a teenager in Denmark, where they seem to be from. 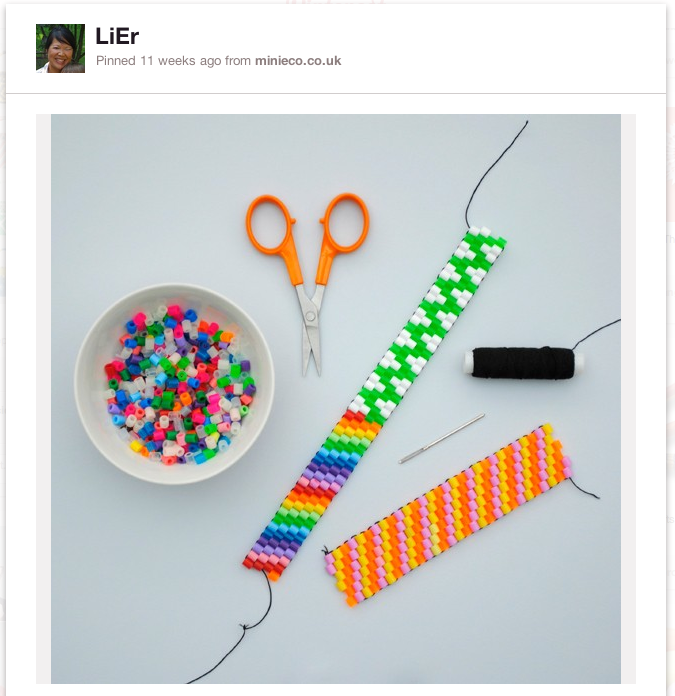 (Perler = beads in Danish) We made intricate designs with tiny little perler beads, which I still have 20 years later. I loved these when I was little. We probably still have some un-ironed ones around here somewhere... Thanks for blogging. 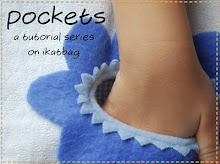 I love your blog, and you were part of the reason why I wanted to get a sewing machine for Christmas- so I could sew. Very cool! My boyfriend and I don't have kids, but we have plenty of Perler Beads in the house lol. Yes, we are nerds. 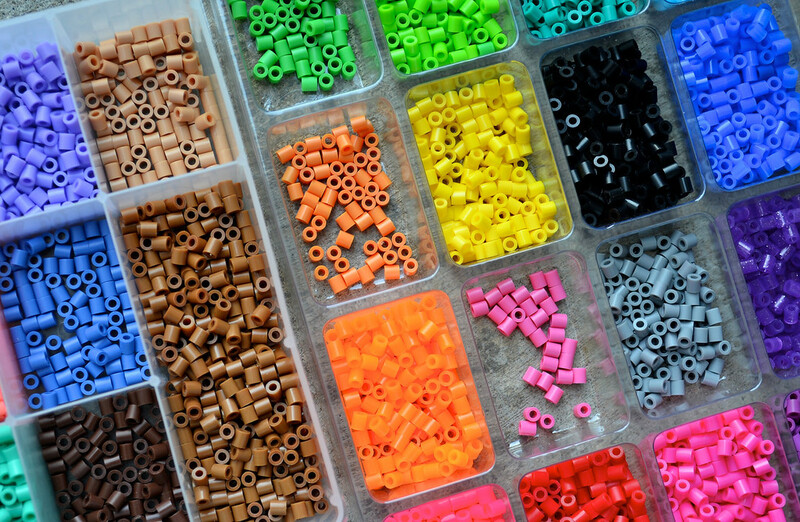 I think its so funny you all call them perler beads, because as jean said, perler means beads in danish. So calling them perler beads is like saying beads beads, ha ha. One can do so many things with these beads, and I see your kids have been very productive. I saw these at IKEA last weekend, but there were no directions and I had never seen them before, so I passed. I think my 3 y.o. daughter would be frustrated if we didn't have a peg board to go with them, but now I want to go back- they'd be great for a rainy day now that I know what to do with them! Besides IKEA in Singapore , where else sells this beads ?